"If you want the best in off-road protection and usefulness, you want ARB’s Bull Bars". What’s a Bull Bar? Only the toughest bumper known to man! These bumpers offer unmatched quality, protection, strength and style and weigh in the 90-100 pound neighborhood. Features: Bull Bars are manufactured with today’s latest technology: computer designing, laser-cut components, mandrel bending and clean quality welds. Mounting systems are engineered to each specific vehicle rather than the more commonly found universal approach. 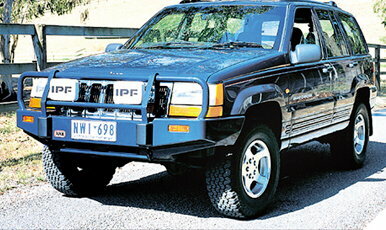 This ensures for uncompromised vehicle protection as well as proper strength for winching. Like everything else ARB does, the powder coating process is top notch. Although ARB Bull Bumpers were designed for Warn winches*, an integrated winch mount with all the necessary hardware is standard on every bumper and will accept other winches. Other features include mounting points for off-road lights and clevis/d-rings, amber driving lights and 1-7/8" diameter tubing for fender and grille protection. Shipping on this bumper is $200. $175 of that is because the bumper must be shipped via truck freight, and $25 is a handling charge from ARB.